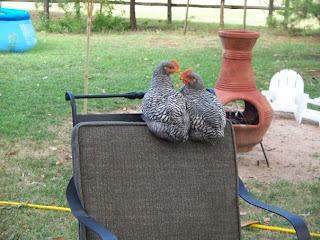 Dave and Lisa's Backyard: CHICKEN TIME! 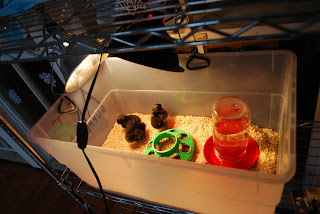 My intention was to check out 2 feed stores, and get a set-up together for chicks. 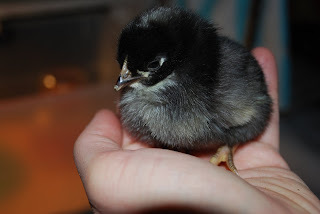 My plan was to get together with a couple of others and go in on an order of chicks so we could each get a varitey of chicks but not end up with 25. The idea was to get everything set up before hand, since I have cats, and need to ease DH into the idea. But, there you go, I was unable to pass by the bin of 75 tiny fluffy bits of fluffy-ness! 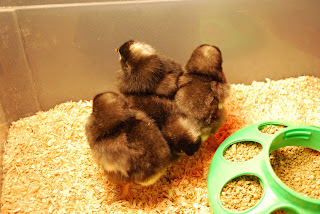 SO we now have 4 teeny weeny Barred Rock chicks! For the next couple of weeks they live in a plastic box with a heat lamp. They will not be so cute and fluffy for long, so I will be taking lots of pics! More later - tomorrow I am not going to any feed stores! I am staying home and getting some seeds started!